The Life of a Wisteria in a Lamp? 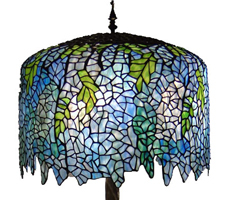 One of the biggest questions regarding the Tiffany Lamps is what exactly makes them so special. How are they different from other lamps with similar motifs? One of Tiffany’s goals was to bring beauty into the home, portraying the simplest experiences of nature’s magnificence through his lamps to such an extent that the nature came to life. In the beginning, Tiffany tried to keep the notion of beauty and nature separate, but in the later years, the lamps thrived on the integration of the two. One of the main motifs was the wisteria, which usually included over 1,000 pieces of glass and sold for four hundred dollars in 1906. The images below are similar to Tiffany’s Multiple-Staged Wisteria Lamp, where the shade mirrors the life cycle of a flowing vine. On one side, the clusters of wisteria that are blue represent the flowers that have already started to bloom, while the white clusters have not started to bloom. 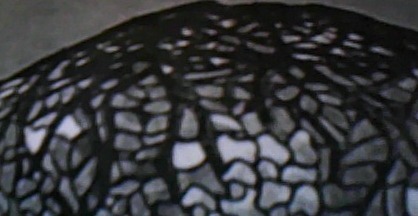 If one follows their eye from left to right, based on the illumination that the light gives, one would see that the shade mimics the advancement of the season. Where the white petals turn to a pale blue and the already blue petals become a darker blue, this is a warmer sun hitting the petals. On the other side of the shade (not shown), as the sun becomes the warmer one of summer, the previously white petals have become a median blue while the original blue clusters have turned a deeper shade and are now purple. The leaves that were a vivacious green on the side that depicted spring (the first side), are now decaying on the second side which portrays the end of summer where the leaves turned to shades of yellow and brown. Starting at the aperture, instead of the conventional crown which was straight, bronze was used to simulate the vines of the wisteria descending down the shade of the lamp. Instead of the shortened branches carrying leaves, blossoms are stemming off, thus extending the clusters so that the wisteria is longer. 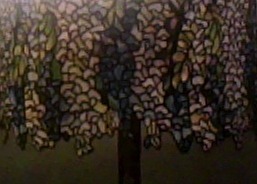 In this shade, the clusters are also wider since the pieces that would normally be background glass are blossoms. The background, though scarce, is effective as manifested through the milky-white transparent glass which shines with a glow of a reflecting sky. Thus, what made Tiffany’s lamps so unique was that the lamps did not just depict moments in nature, but the life and evolution of nature.